The last issue of St. Peter's (Lytham) "Bazaar Gazette," contained a further instalment of the history of St. Peter's, from the pen of the Rev, Father Greaves, which is an interesting account of the progress of local Catholicism. 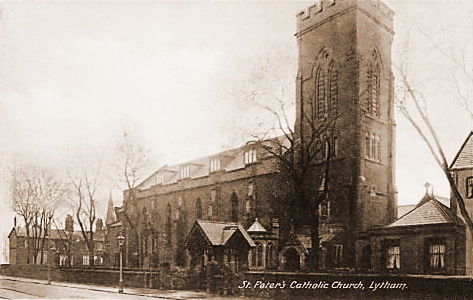 Up to the year 1800 the Catholics of Lytham and district attended Mass in the Chapel in. Lytham Hall. As we have already seen, Mass was said here from the year 1606, when Sir Cuthbert Clifton built the first Hall. In the year 1800, this chapel was closed to the public. In its place, a Tythe Barn, just outside the Park, was fitted up as a chapel. The priest-in-charge —the Rev. Father Pope—removed to a house close by, called the Woodlands. For almost forty years, our forefathers assembled in the old Tythe Barn to join in the Holy Sacrifice of the Mass. They thought nothing of walking long distances to Mass, and when they approached the Sacraments they prepared themselves long beforehand with great care. Their religion was the solid, unostentatious religion that had been tried in the fire. We must bear in mind that the days of persecution were only now coming to an end. They were still feeling the effects of it. In consequence of this, Catholicism had passed out of the life of the nation, and even out of the knowledge of the average Englishman. Cardinal Newman, in a striking passage of his sermon on 'The Second Spring,' gives us a good idea of Catholicism at this time. No longer the Catholic Church in this country, nay, no longer, I may say, a Catholic but a few adherents of the old religion moving silently and sorrowfully about, as memorials of what had been. 'The Roman Catholics'—not a sect, not even an interest, as men conceived of it—not a body, however small, representative of the great communion abroad, but a mere handful of individuals who might be counted like the pebbles and detritus of the great deluge, and who, forsooth, merely happened to retain a creed which, in its day, indeed, was the profession of a Church." A new life had now begun for the Catholics of this country. They had gone through the fire of persecution, and had suffered for years those unjust Penal Laws which had been passed against them. In 1791, a Bill was passed—almost unanimously--in both Houses of Parliament, for the relief of the English Catholics. In consequence of this 'Toleration Act' and the Catholic Emancipation Act of 1829, a 'great increase took place in the number of .Catholics. interspersed here and there with a fair number of habitations of recent origin. There were two inns, the What Sheaf and the Clifton Arms, beside two small licensed houses. There were several shops in the village, and a house of Confinement, containing separate tells for the detention and punishment of any offender against the law. The most pretentious dwellings stood upon the north portion of the tract, known as the Marsh. There was no elegant promenade, with its expansive sward as at present, but the whole space, at one end of which Mr. Cookson had erected a Windmill, was covered with miniature sandhills. Two steamers plied daily between Preston and Lytham!. In the year 1801, the population of Lytham was 920 persons. In the year 1804, the Rev. Thomas Dawson took charge of the Mission at Lytham. Owing to his weak health, he was assisted by the Rev. John Lawson. From a pamphlet printed in Liverpool in 1819, on Catholic Chaplains, with their respective congregations, we find the number of Catholics in Lytham and Lancashire. The Hundred of West Derby (including Liverpool and Wigan) had a Catholic population of 33,200. Salford Hundred had 15,880, and the Hundred of Amounderness had a Catholic population of 12,650. Of these, Preston, with two chapels and four priests, had 6,000 people, and Lytham had a congregation of 500 people. During these years, Lytham made steady progress. Buildings of modern and pretty design sprang up along the Beach, while others were erected in Clifton Street. During the summer months hundreds of day visitors found their way in carts, waggons and lighter vehicles to the coast of Lytham. They came from Preston, Blackburn, Burnley, and other inland towns. The following is a description of the attractions of Lytham in the year 1821. "Lytham is a very salubrious place; its walks are pleasant and diversified. You may walk for miles on the sand westwards. You may trip to the Hey-houses and get bad ale. Commonside offers a journey, which,. if you please, ends at Blackpool. The walks are many and various for those who love exercise. The lazy will soon tire here, but the actives will never be at a loss. The sands are fine—the sea breeze pleasant —the air is impregnated with health." At this time the population of Lytham amounted to 1,292 persons, consisting of 258 families. As we have already seen, the number of Catholics attending the Chapel in the old Tythe Barn was at this time 500. For 25 years, Father Dawson and Father Lawson laboured among the Lytham people. In the year 1829, they were transferred to the mission at Croston. They were succeeded at Lytham by the Rev. Joseph Walmsley.